Book lights for reading in bed are technically encouraging “bad” habits, but staying up past your bedtime is worth it to finish that chapter! We’ve researched and reviewed some of the best options around to help you choose the perfect reading companion. But first, check out these features to consider when searching for a new book light. Light Source - LEDs are a common source for portable book lights, but our top pick actually uses incandescent bulbs! Bulbs - More bulbs usually means more brightness at your disposal, but that depends on your preferences. Brightness Control - Having multiple brightness settings ensures you’ll never be blinded or squinting when you should be reading! Material - Plastic and metal are the most common materials. You may prefer a plastic book light for taking traveling. Power Source -Disposable batteries, rechargeable batteries, and plug-in power are the main options available for powering your light. Duration - How long does it last? LEDs have long life spans, but batteries, unfortunately, do not have the same power! Ready to read? Of course you are! The top pick and budget pick summarize our favorite options among book lights, but there are a lot of options out there that we included, too. Everybody will love your new book light--especially your sleeping partner! The Zelco Original Itty Bitty Book Light is our pick for the best book light for readers who prefer a bright light that doesn’t strain the eyes. This book light uses traditional incandescent bulbs rather than LEDs, which have the benefit of producing a warmer light that can be easier on the eyes. The product comes with a battery pack, AC adapter, and a spare bulb to back you up, and it’s designed to clip to the cover of a hardback or paperback book. It has a rigid neck and an adjustable head angle, which provides more structure than the fully bendable necks of gooseneck book lights. The eight-foot cable and AC adapter make this a great option for the bedroom that won’t take up much space! The only downside is that incandescent lights are more prone to heat issues than LEDs. If you’re not sold on our top pick, keep reading--there are more great options out there! Finding a book light on a budget just got a little easier with the Wellmike LED Clip Reading Light. Two LEDs provide bright white light that turns on automatically when you lift the lamp head--no buttons or switches involved. It’s designed to clip directly to your reading material to illuminate the pages. The tough ABS plastic body is durable and compact, making it a great choice for traveling and camping. The lamp is powered by three AAA batteries. This makes it most convenient for home use, since bringing batteries with you on the go can be a hassle. It makes a good book light for children since it’s so easy to use, and the battery plate can’t be removed just by hand. 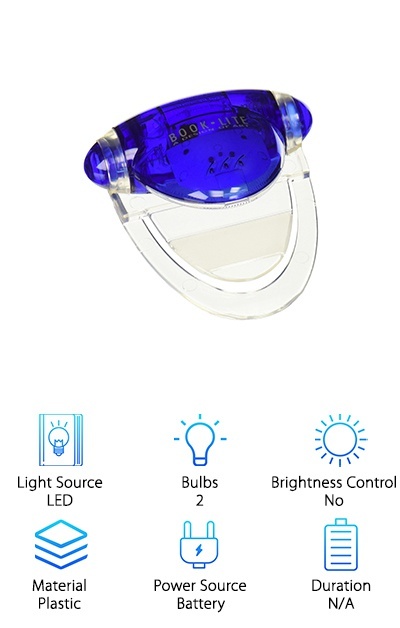 If you’re feeling frugal and just want something simple that can really take a beating, this LED clip reading light might be your favorite option! The AMIR Clip On Book Light features soft 5500K LED lights that help to reduce eye fatigue. The base can stand on its own or be clipped to a convenient edge. The clamp opens up to 1.96’’ for attaching the lamp to books, shelving, and more! Tapping the base adjusts the lamp to three levels of brightness. On the dimmest setting, the lamp can last up to 24 hours before needing to charge, and 6 hours on the brightest setting. Just use the included USB cable to plug it into your laptop or car charger for convenient charging without needing an extra outlet. The impressive battery life helped this AMIR clip-on book light make it to our book light review. It’s also ultra-lightweight, so it’s convenient to travel with as well! The LEDs have a total life expectancy of 50,000 hours and don’t get hot during extended use. Do you dream of finding the best book light for reading in bed? The LuminoLite Warm Book Light just might fulfill your deepest desires! Twelve natural warm LEDs provide a softer “color” of light that is easy on the eyes. Adjust these LEDs to one of six brightness settings depending on the situation. This book light has two independent lamp arms that can be adjusted to different angles, perfect for fully illuminating both pages of an open book. The rechargeable battery lasts up to 10 hours, and can be recharged using the included USB cable and AC adapter. Plug it into an outlet at home or into your laptop while you’re on the go. 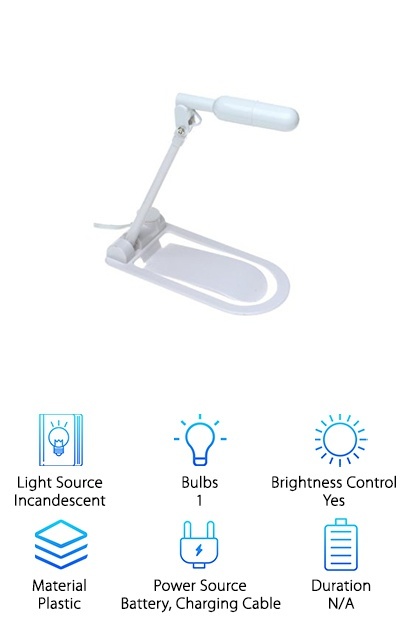 This reading light combines a warm light that helps reduce eye strain with the precision angles of two lamp arms. If you like to read magazines or large print books, the two lamp heads can help fully light the large pages. The Ariza SensiLamp Book Light is one of the best book lights for people who want options and bright lighting. With 14 LEDs at your disposal, you’ll have plenty of light even for reading in pitch darkness! The lamp can be adjusted to three brightness modes, lasting 5 hours on the brightest setting and up to 24 hours on the dimmest setting. Just tap the base to adjust the brightness. The lamp can stand on its base or be clipped to a shelf, nightstand, or headboard for flexibility, and you can bend the 9.5’’ gooseneck in any direction you please! A USB cable and wall outlet adapter are included, so you can charge the lamp’s batteries from your laptop or other devices as well as via outlets. This bright and flexible book light is travel-friendly and won’t clutter the bedroom with cords. Read in the car or in a hotel room as well as in the comfort of your own home! The Mighty Bright ExtraFlex2 comes in black and metallic pink or purple color options to customize your book light choice. 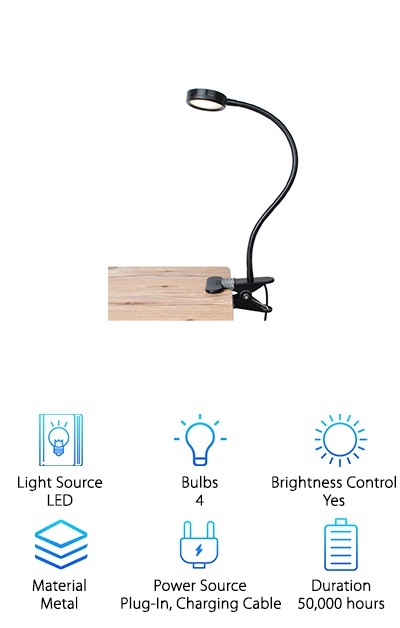 This mini clip-on book light has an 8’’ long gooseneck and a freestanding base that can be set upright or clipped to things like headboards, shelving, and so on. Two bright white LEDs are powered by three AAA batteries (included with the product to get you started). Tap a button to use one or both of the LEDs for dim to dark environments. A clip-on light can be a great addition to a reader’s bedroom or other shared areas so they can work on their reading while others in the room get some rest. The clip-on style is handy for people who dislike wearable neck lights. Taking batteries with you on the go can be a pain, however, so you may prefer a rechargeable option if you want to take your book light traveling. 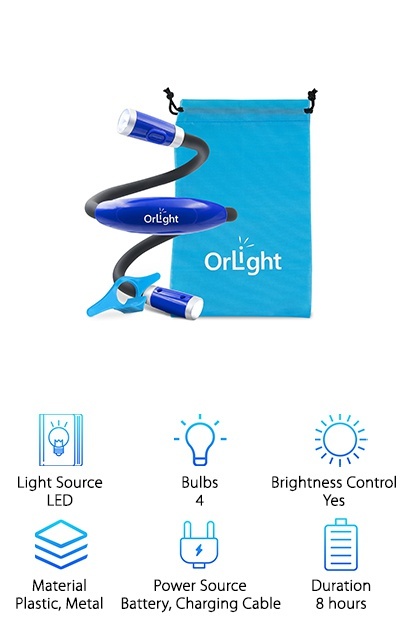 Take the OrLight Neck Light anywhere you want--and bring a book! This flexible night light can be bent and adjusted for reading at a variety of different angles without irritating other people nearby. Rechargeable batteries mean you don’t have to deal with running out to buy new batteries or a tangled power cord. It recharges with an included universal micro USB cable. This book light can be set to four levels of brightness depending on the situation, from reading a quick chapter at sunset to turning those last few pages late at night! A couple of little bonus items are included, like a simple bookmark and page-holding tool and a drawstring bag to keep everything together more easily. 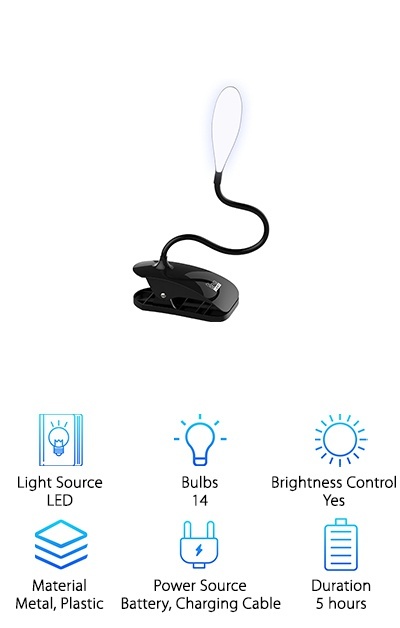 This reading light is convenient to take with you on the go if you’re traveling, or just to keep with you while you’re moving around the house. 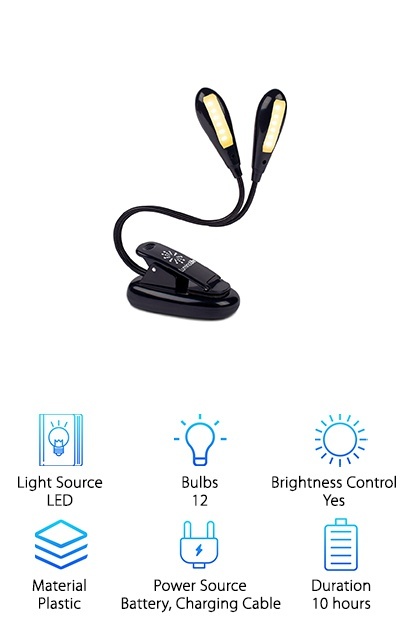 The LEPOWER Clip-On Reading Light clips onto anything up to 2.3’’ wide, from headboards to desks and more. The metal gooseneck is fully flexible and bendable, measuring 15’’ long to give you lots of room to maneuver and adjust as needed. 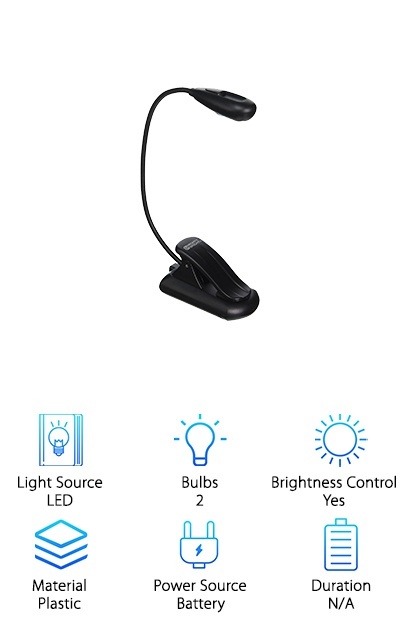 This reading light has a longer neck than typical reading lights, so it may work well in the bedroom or at your desk as a permanent fixture. 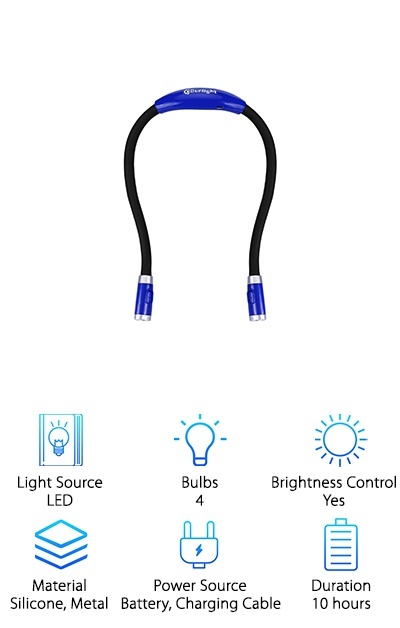 A five-foot long USB cable allows you to power the light from your laptop or other device, or use the included outlet adapter to plug it into the wall. The lamp can be adjusted in several different ways: selecting warm light, white light, or both, as well as adjusting the brightness to dim or bright. 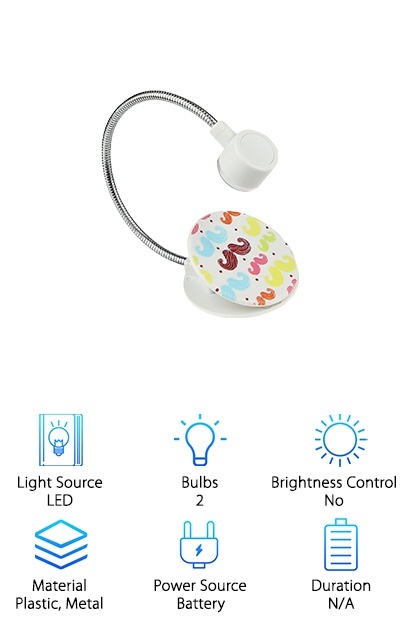 This is a strong contender for the best book light for bed readers who want to avoid eye strain without disturbing others who are trying to sleep. Carson offers a variety of reading light solutions, but the FL-90 is undoubtedly one of the cutest. Choose from pattern themes like wine, books, moustaches, paisley, and waves to customize your book light! This clip-on book light can be attached to your book, e-reader, tablet, and more. Two bright LED lights top off the end of the fully adjustable lamp head. The whole thing is powered by two CR2032 button batteries, which are included with the product. If you’re looking for a basic book light, the FL-90 is a flexible option that works with a variety of reading mediums and settings. Some people may prefer a clip-on style to a wearable book light that goes around the neck. It’s easy to pack in a purse or carry-on bag for travel and is a great no-fuss choice for reading whenever and wherever you want. 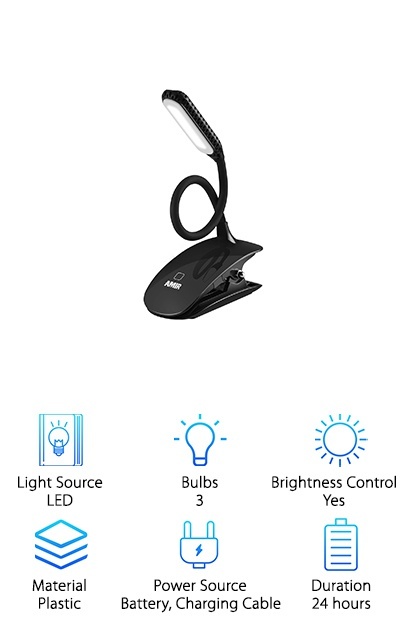 Looking for the best reading light that doesn’t require a clip or an outlet?The CESunlight LED Book Light features two bendable arms that you can adjust to the perfect angle for your reading materials in any situation. You can wear it around your neck to read in bed without disturbing others. A 700mAh lithium battery powers the four LEDs, lasting up to 10 hours on normal brightness and 6-8 hours on high brightness. Each arm has two LEDs that you can control separately. You can adjust the brightness to three levels on each arm of the book light: wide-angle, spotlight, and both combined. The arms are made from steel alloy coated with silicone, so this book light is tougher than you might think despite weighing just three ounces! It recharges in three hours with the included USB charging cable. This book light is ideal for travel and reading on the go due to its compact size and durability.